You won't have to wait until the MMFF after all! 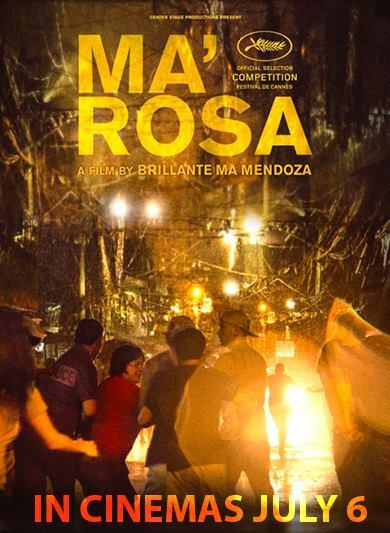 (SPOT.ph) After its award-winning run at this year's Cannes Film Festival, Brillante Mendoza's Ma' Rosa is coming home...and even sooner than expected! According to a report by Interaksyon.com, the film is set for a nationwide commercial run on July 6, but a list of participating cinemas has yet to be released. It's possible that SM Cinema will be screening the film, as Mendoza works closely with the cinema chain for his independent film festival, Sinag Maynila. Earlier, Mendoza announced that he had plans to enter the film at this year's Metro Manila Film Festival, and that the committee was open to the idea as long as it won't have any commercial screenings until the festival in December. He has yet to reveal why he decided not to enter Ma' Rosa in the MMFF. However, MMFF executive committee member Edward Cabagnot told Interaksyon.com that "nothing is definite yet as the rules are still being tweaked."